If you are in the process of planning a rustic wedding in Tennessee, it is very likely that mason jars are on your shopping list. They are a staple for rustic wedding decor, and the perfect item to use for a variety of different ideas. Country Jewell has seen this done successfully in many different ways. Here are 10 that you may want to use for your own wedding. This is probably the most common use for mason jars at weddings. They make excellent vases for holding floral arrangments for reception table centerpieces. You can also place a few empty ones on the head table to hold the bride's and bridesmaids' bouquets during the reception. Another item commonly used inside mason jars for centerpieces is candles. They contain the wax from melting votives nicely, and you can also put water inside them for floating candles. If you're into DIY candle-making, mason jars can be filled with wicks and wax in your wedding colors, making the entire item the candle rather than just a candle holder. 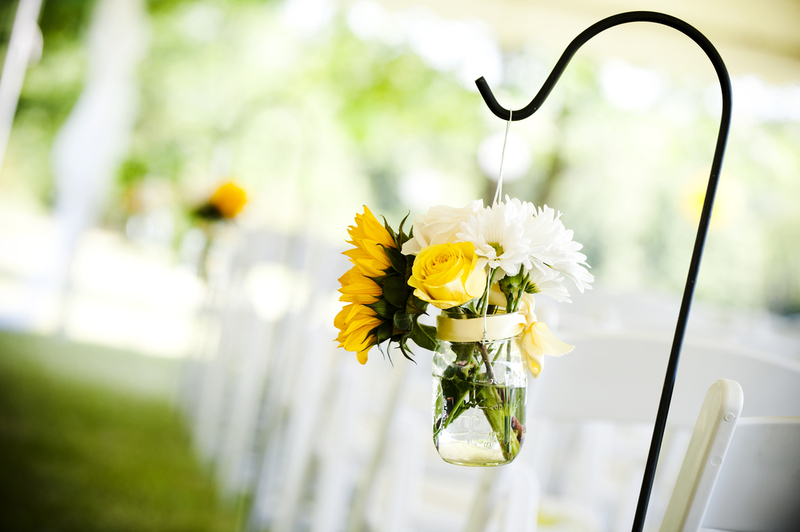 Mason jars can also be filled with flowers or flameless candles and placed on the ground on either side of the aisle that the bride will be walking down. If you wrap a pretty ribbon or string around the top, these decorations can also be hung from shepherd's hooks or the outside of the chairs on either side of the aisle. 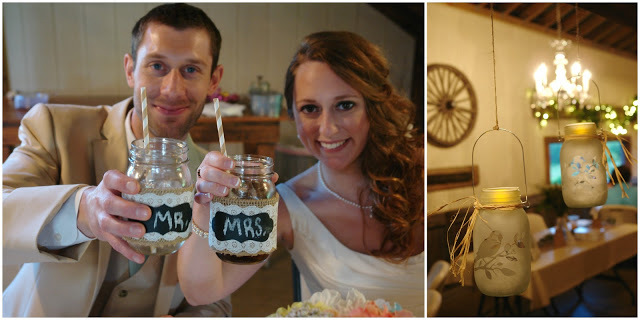 There is no better cup to drink out of at a rustic wedding than a mason jar! It fits the theme beautifully and can hold quite a bit of the beverage of your choice. Many today even come with handles attached specifically for this purpose! Go one step further and put guests' names and table numbers on the mason jar drink glasses. When they get to the reception, they will be able to easily find their seat and grab a drink on the way. Another thing that can fit neatly inside a mason jar is most of each guest's place setting. Put a pretty napkin inside, then place the utensils, straw, and anything else they may need for dinner inside too. They can be placed on a table at the beginning of the buffet line for guests to pick up. You can also place the utensil-holding mason jars at each place setting. Then, all you have to do is add the guest's name that will be sitting there and you instantly have your place cards taken care of! They fill out the decor on the reception tables too, meaning your centerpieces can be simpler yet the table will look full and beautiful. You can cook baked goods directly inside mason jars like cakes and pies, meaning you won't need extra plates on the dessert table. They are also wonderful for holding non-baked desserts that can be layered and could even double as ice cream sundae bowls. 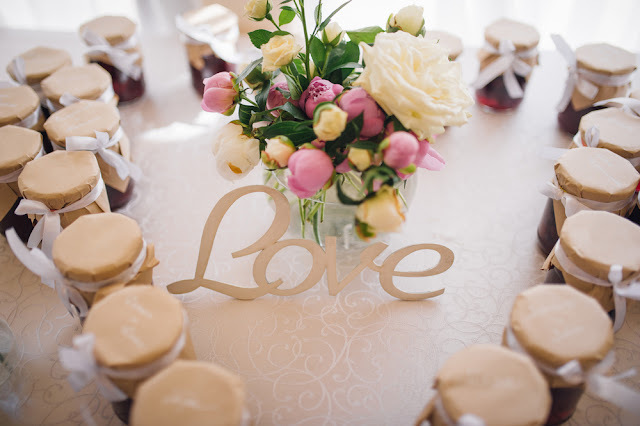 Mason jars can be used as pretty containers for thoughtful items that your wedding party can use. For the ladies, you can make a "spa in a jar" by filling it with sample-sized lotion bottles, face masks or creams, nail polish, emery boards, etc... For the gentleman, possibly things they may need before the ceremony like gum, mints, snacks, and items like that, or single-serving bottles of their favorite booze and mini cans of soda or other mixers. These incredible jars can also be used to hold favors for your wedding guests to take home with them. 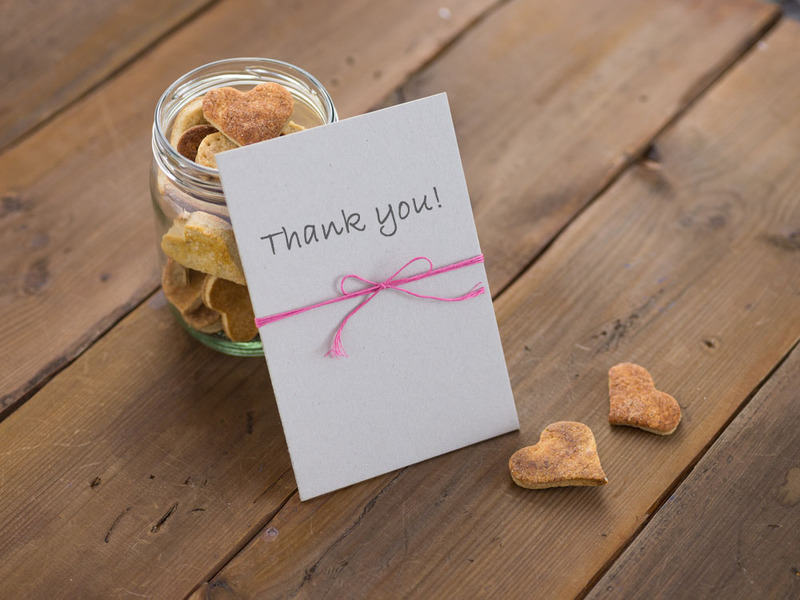 Attach a note thanking them for joining you on this special day and fill the jar with candies, homemade treats, or the ingredients and a recipe for your favorite cookies. Those are just a few very simple ideas for ways that you can incorporate mason jars into your decor at our scenic wedding venue near Knoxville. Next week we'll have some great ideas for what you can do with all of those mason jar decorations after your Country Jewell wedding too!